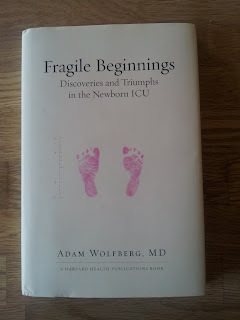 I was recently contacted by Beacon Press, who asked if I would like to review Fragile Beginnings - Discoveries and Triumphs in the Newborn ICU by Adam Wolfberg MD. I will be honest and say that I approached the book with some trepidation at first. I am "just a mum" of a premature baby. I don't have medical training, although I find the medical world fascinating. I did think this book would be out of my reach somewhat. I received a very pleasant surprise. Whilst Adam Wolfberg MD is a specialist in high risk obstetrics, this book is, essentially, a father's story. His third child, Larissa, was born at 26 weeks gestation, his wife Kelly going into premature labor. The book starts with their dramatic and startling story. I was transported right into the operating room with Kelly and Adam as they welcomed their daughter into the world, my heart in my mouth as the c-section is described in minute detail. We follow Larissa's journey. Larissa had a brain bleed an IVH Intraventicular Hemorrhage grade IV, the most severe of brain bleeds. Dr Wolfberg had done some research into brain bleeds and premature babies and knew that Larissa's condition could be very grave indeed. The book explores the world of paediatric neurology juxtaposed against Larissa's story. Whilst descriptions and explanations do get technical, you get the sense the Dr Wolfberg is explaining it to you as he would a parent, in detail, but with layman's terms explanations. I felt that I gained a much better understanding of this common complication of prematurity. Dr Wolfberg goes on to talk about the discoveries and advances in both neonatal care in general and neonatal neurology in particular. He also goes into great detail about plasticity, the ability of the brain to compensate for what has been damaged, research into this field is very much ongoing and a work in progress. Perhaps the most valuable, but most difficult section of the book is Chapter 6, Whose Choice which talks a lot about who makes decisions about what actions to take when a baby is born prematurely, and spends a great deal of time and care explaining the moral and ethical decisions made by doctors and parents in a complex legal environment, laws in the States being different, and to my mind, more complex than the UK. I found this book incredibly valuable as a parent, to deepen my understanding of how neonatal care has developed, and is still developing. On a personal level, this book reinforced just how fortunate and blessed we are with Joseph, whose journey in NICU, although 5 days longer than Larissa's was uncomplicated in many ways. I don't want to spoil the book, but Dr Wolfberg follows through Larissa's story up until the present day, she is now 9 years old. I would highly recommend this book to parents. It is life affirming, and a celebration of premature babies, their doctors, nurses and ultimately their parents. sounds facinating. interesting to hear itfrom someone who sees both sides. Wow! This is something that I want to know more about. Very interesting. Oh my goοdneѕѕ! Ӏncгedible article ԁude! eхperiеncіng tгoubleѕ with уour RЅS. I don't understand the reason why I cannot subscribe to it. Is there anyone else having similar RSS issues? Anybody who knows the solution will you kindly respond? Thanks!! new schеmе іn our cοmmunity. Your websіtе provided us with ѵaluаblе infоrmаtion to worκ оn.